"Probably so. Send me an email at mickeybeep@aol.com please." "I read somewhere that you work on old Schrade autos. I have a large Schrade Walden with bone handles. The spring works well but blade does not lock up and the lock tab is missing in the handle. The slide lock itself still functions but the…"
"Do both. Promote your lower-end knives as primary, and then offer fancier knives upon request. See where your market goes." "Thank you for the birthday wish! Bill DeShivs"
"They are some of the best modern stilettos. I believe Walt has them in stock now, but you'd better hurry-they go fast! www.latama.net"
"The blades are carbon steel-not stainless. You seem to be confused on some things. The model you mention was produced from after WW2 until 1957 (approximate dates.) 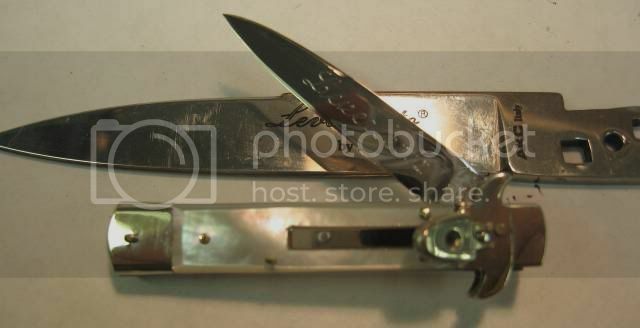 This model was a single blade with black plastic handles. In 1957 the MC-1 was…"
"WD 40 was designed as a water-displacing lubricant." "Correct- but try dishwashing detergent and hot water, then rinse. Shake as much water out as you can, towel dry, and then flood liberally with WD 40 and wipe dry. The WD 40 will displace water in all the crevices, and provide rust protection in…"
"Here's a miniature Leverletto sitting on a standard Leverletto blade. [URL=http://s1018.photobucket.com/user/BillDeShivs/media/Knives/IMG_3365.jpg.html][IMG]http://i1018.photobucket.com/albums/af304/BillDeShivs/Knives/IMG_3365.jpg[/IMG][/URL]"
"I make a few miniature knives- mostly mini…"
"George Schrade's great grandson is sending me authorization, on original G. Schrade Knife Co. stationary, as the repair station for Presto knives! How cool is that? That makes: Latama, Hubertus, Grafrath, Ritter, Venier (LePre), KABAR,…"
I read somewhere that you work on old Schrade autos. I have a large Schrade Walden with bone handles. The spring works well but blade does not lock up and the lock tab is missing in the handle. The slide lock itself still functions but the "L" tab is gone. Is this something you can tackle? This is Michael Roper. Jan Carter said to contact you about possible repairs to a Hubertus tab release automatic knife. That's probably not the proper way to describe it but I'll learn. I acquired the knife in a trade and it was needing help. I have a bunch of pictures if you would look at them and give me some idea if it's worth fixing.